Some 3,000 electrical workers from the U.S. mainland — with the required equipment and tools — will join Puerto Rico Electric Power Authority crews to continue the task of restoring the island’s power grid, the corporation’s Executive Director Ricardo Ramos said. Most of them will be mobilized through the Mutual Aid Agreement of the American Public Power Association and the Edison Electronic Institute. The mobilization will be staggered and must be completed around Nov. 27, he said. “To strengthen our team and meet the goal established by Gov. Ricardo Rosselló of restoring 95 percent of the generation by Dec. 15, we have requested linemen specializing in mountainous terrain, five helicopters, personnel to coordinate the work logistics, as well as materials, resources and equipment available to the governors of the states of Florida and New York,” he said during a news conference. 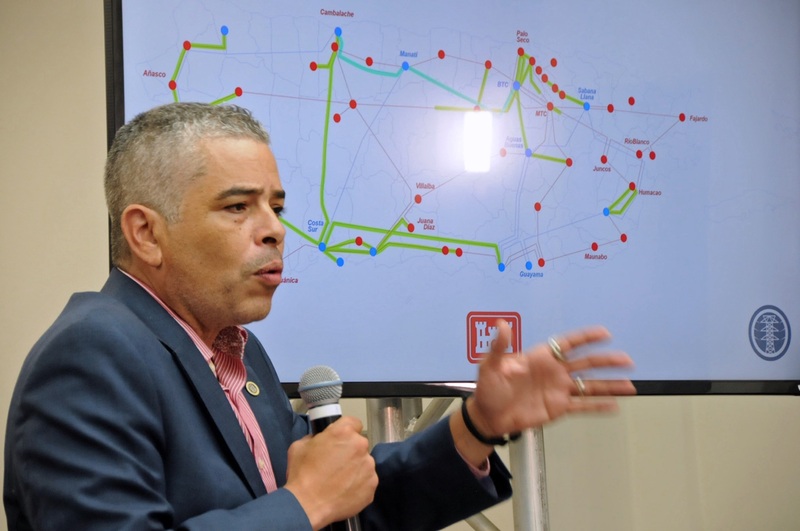 Ramos presented an updated report of the rebuilding efforts following the back-to-back strikes by Hurricanes Irma and María in September, as well as the transformation plan for the public corporation to improve the quality of the service offered. As of Tuesday, PREPA reached 42.4 percent of power generation, approaching the goal of 50 percent by Nov. 15, 2017. Power generation does not equate to the number of customers who have electrical service available. Because the majority of PREPA’s infrastructure knocked out, the public corporation was required to replace hundreds of poles and miles of cables. The agency received shipments of materials, equipment and supplies on Nov. 2-7, including 207 70-foot poles. “This week we received part of the ordered materials, worth $50 million. These arrived by barge and include the supplies that will be used by Power Secure, 400 workers from Fluor, more than 200 workers from Power Secure, another 400 from Cobra Energy, and cargo with more than 260 poles, 40 feet tall,” said Ramos. With regards to PREPA´s transformation plan, Ramos said it consists mainly of the development of distributed generation and micro grids; providing stable power at a low-cost; building modern, efficient and world-class generating plants; complying with environmental regulations; and promoting Puerto Rico’s economic development. The initiative envisions increasing the use of technology to facilitate processes, stabilize finances through the adoption of the government’s Fiscal Plan; improve service offered to customers; and lead PREPA to a total transformation, aligned with the trends of the global electrical industry, Ramos said. “We intend to transform PREPA and turn it into a modern, efficient and successful company that responds to the demands of our residential, commercial and industrial customers, and goes along with our island’s socio-economic development,” he said, noting the effort will include public-private partnerships in the area of power generation. Hey Buddy!, I found this information for you: "PREPA chief: 3K extra staff to join power system rebuild". Here is the website link: https://newsismybusiness.com/power-system-rebuild/. Thank you.